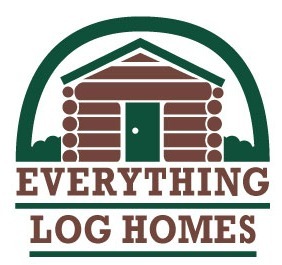 Using cabin rugs in your log home is one of the easiest ways to add color, texture, warmth and excitement to your decor. Rustic rugs help define areas in an open floor layout, and they give your home a cozy feel. Wildlife rugs are quite popular in log homes and timber frame homes. When you decorate with rustic furnishings, do not overlook the interesting wildlife themes for rugs that you can use. Sometimes the right accent rug can be difficult to find. Fortunately, you can mix and match your themes a little when you are choosing wildlife in the woods or a theme with animals like deer or bears. If you have chosen one of many wildlife themes for your log cabin home, then you might use a wildlife theme rug for your common area. Of course choosing cabin rugs can be challenging, as your accent rug can end up being the center of attention in your room. But, don’t let that stop you from choosing! Picking the right rug for your main area is lots of fun! Remember to choose a cabin rug with colors that go with your color scheme. You’ll often find natural, earth tones like browns, tans, beige, green, rust, and gray in Nature. Choose a rug that includes those colors and that goes with your Wildlife color scheme. Lastly, consider what shape and size rug you will need. Where do you intend to place the rug? How much room do you have to work with? The answers to those questions will help you decide how large an area rug to purchase. Make sure you check the write-up on each rug, as many rugs are made in only a few sizes. Let’s face it…Bears are awesome. They are fun to watch in the wild, and they are great to use in rustic decorating. Bears go with just about any country or rustic décor. And they come in such a variety of themes—some are serious and very realistic, while others are playful and have a lighter theme. When choosing an area rug, consider the fabric content, the size of the accent rug and the colors that are dominant in it. In addition, where do you plan to use your accent rug? If it will serve as a hearth rug, the fibers should be fire or heat resistant. If it will be the center of attention in the room, will the motifs be visible, or will they be hidden by furniture like a coffee table, sofa and chairs? 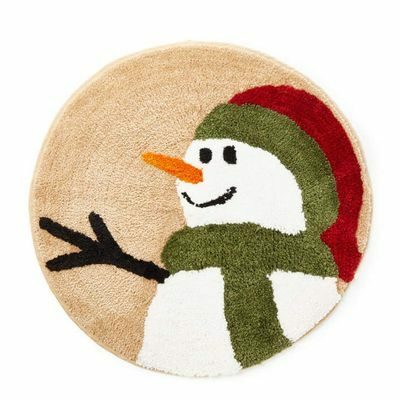 Finally, if your rug will be placed at an exterior door, can it be washed or cleaned? Would a brown bear rug complete the décor in your rustic cabin or lodge? A bear rug, whether a grizzly bear rug, a Kodiak bear rug or a brown, can add interest and excitement to your wildlife theme. While you can use a brown bear theme anywhere, it is especially effective when you live in the North or West, where brown bears live. Why Buy a Bear Rug? A bear rug can complement your wildlife theme, and bear rugs work well in a rustic cabin or lodge, whether in the mountains, in the woods, or by a lake. 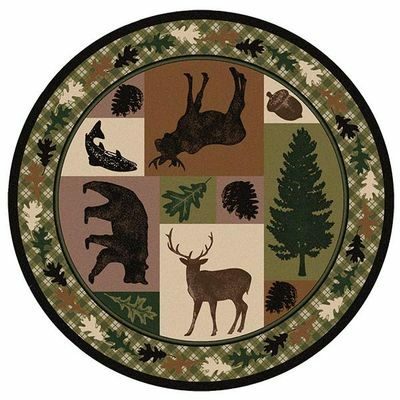 Looking for a rug that you can curl up on, in front of the fireplace, or a rustic cabin rug that will pull your wildlife theme or bear theme together? A bear rug is a fun country cabin or lodge furnishing. Of course you can choose a bear rug with serious, beautiful bears that bring the real outdoors into your cabin. 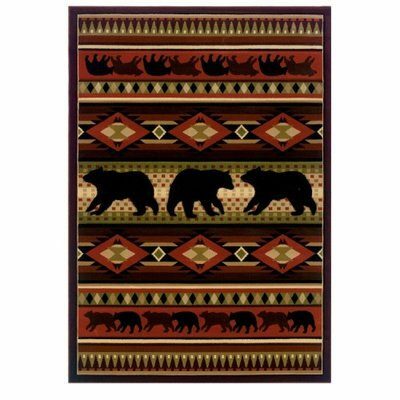 You may like more realistic bears or stylized bears with native American designs, to give your home a Western décor. Or, you can choose to use whimsical black bears to create a casual and fun vacation atmosphere. 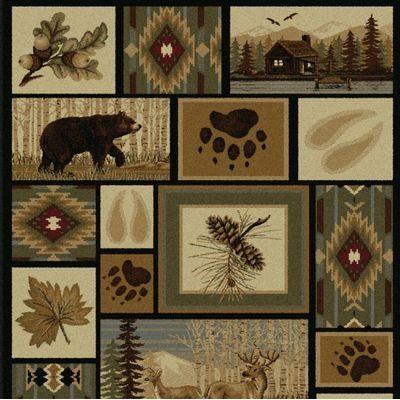 Either way, a rustic cabin rug with a bear theme will add a lot of character to your home. Bears are part of American life. You find them in the woods, in the mountains, by the lake or river, or in the West. And they reflect our love of Nature. If bears are near and dear to your heart, then you’ve come to the right place. Using bears in your home decorating, can add fun and interest to your home. Nothing says natural more than a bear, so, if you love bears as much as I do, why not include a few bear pieces in your interior decorating and, perhaps on one of your rugs? A moose rug is great in your North Woods décor. You will find that it will blend in well with large game species, with fishing, and with almost any wildlife décor. A moose rug can be the center of attention in the room—a large moose in the center of your sitting area. Or you can use one of the smaller moose rugs to complement the other wildlife items in your room. Since your area rug is one of the largest pieces in the room, pick one that you really like, and you should be able to enjoy it for years! 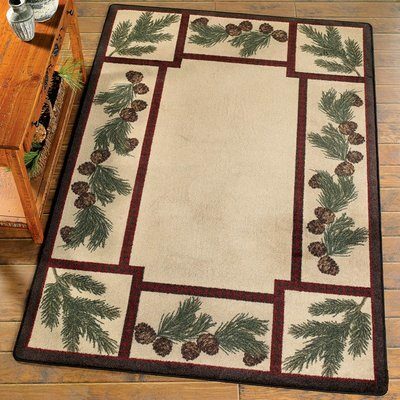 Moose accent rugs can add class and interest to your rustic cabin décor. Of course if you are a moose lover, as many of us are, you will want to make sure that there are some moose decorations in your rustic cabin or lodge. 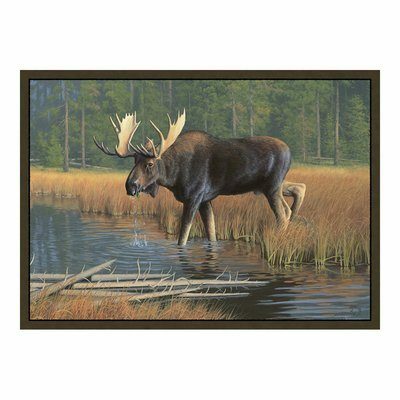 A Moose area rug can be used in a North Woods theme, a wildlife theme, a moose theme, or with other wild animals like deer, elk, or even fish (for a lake theme). When you use an area rug with large pictures on it, keep your walls plain and simple. This is to make sure that your moose rug is the prominent feature of your room. If you use a moose rug with very small pictures on it, you might use a large moose tapestry or even a moose statue as the center of attention for your room. Or, if in a bedroom, try selecting a moose comforter set that you’d like to feature, in addition to the accent rug. If the bed will be placed on the rug, remember to consider what will actually show when the bed is placed on the rug. Your timber lodge or log cabin will come alive with the outdoors if you pick interesting wildlife décor, and you will enjoy many cozy evenings in your cabin getaway! Wolf area rugs look great in log cabins or timber homes. Decorating with wolves and wolf puppies brings the wild outdoors inside and helps to develop your rustic decorating theme. 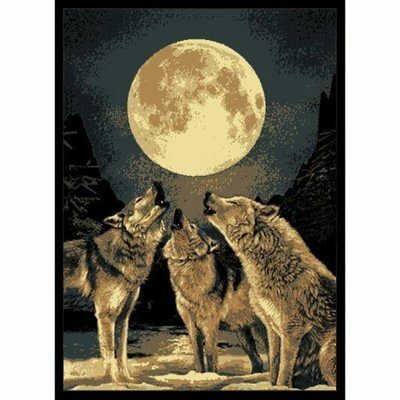 However, sometimes it’s hard to get all your wolf wall decor, figurines, furniture, bedding and lamps to work as a unit. A wolf rug can pull it all together for you. And there are so many attractive wolf area rugs that you are sure to find one that you will like. Keep in mind that you want to get an accent rug that has colors similar to your other pieces, as well as a complementary theme and style. The gray wolf is the most common wolf, and it is known by a number of other names: common wolf, timber wolf, tundra wolf, Mexican wolf and plains wolf. Despite its name, the gray wolf can actually be anywhere from black and green to almost white. They grow to be 4 to 6.5′ long, and they can weigh up to 175 pounds. Gray wolves tend to live in remote wilderness areas. Wolves are social animals and they live in packs. A pack consists of a dominant male, a female and their young who are called pups, when they are little. A pack often has 10 to 30 members. The leader of the pack is an alpha male. His role is to guard the pack, and a leader may kill other wolves who intrude on his pack’s territory. Wolves hunt in packs. They often will target the weakest or sickest animal they find, circle it and then go in for the kill. Wolves are nocturnal animals. They hunt at night and sleep in the daytime. Each wolf can eat up to 20 pounds of meat at a single meal. Wolves don’t stay in the same place very long, and they can travel 12 miles each day. Howling is a form of communication, and wolves tend to howl mostly to other wolves in their pack. Wolves are similar to dogs, in that they love to play, they chew on bones and they will growl or snarl at another animal that appears to be a threat. A western rug can have a number of themes, like horses, wolves, or cowboys. And they often reflect the colors of nature around them, with muted red and brown tones. Log cabins or timber ranches with a Western theme tend to be casual. And you’ll often find a mixture of Southwestern Indian patterns, horses, cowboys, rodeos, wolves, coyotes and the Western star. Western area or floor rugs can help pull your room together, so choose a cabin rug for your Western theme that will complement the rest of your room’s accessories. 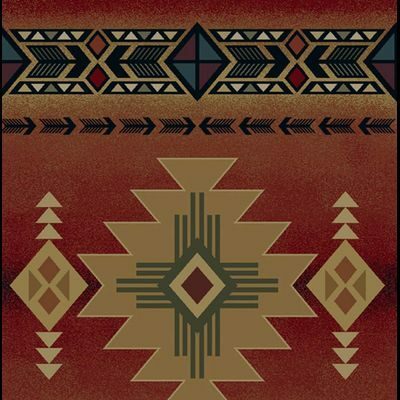 Using a Western rug can add interest and natural colors to your western or southwestern decor. Wild West – Use old timey decorations and keep your accents and pictures in the same time frame. Horses – There are still many horses in the West. They always work well in Western decorating. Buffalo – Not everyone knows it, but there are still a few wild buffalo in the western states. Wolves – Almost extinct a few years ago, wolves are plentiful now—ask the ranchers in the West! Cattle – Cattle and ranches always work in a Western theme. A beautiful Western rug can add warmth and comfort to your Western themed home. And Western area rugs come with many motifs that can help pull your Western or cowboy décor together. Choose a Western rug that has a similar theme to the rest of your room. It should not be overpowering, but should blend in with the other furnishings. Western rugs provide warmth, coziness and muted color tones that are soothing, and they can help to bring the great Western outdoors into your home! Using duck accent rugs is the perfect solution for a log cabin or rustic lodge by the lake. Using a combination of duck and fish rustic furnishings is perfect for a fishing lodge or cabin. Two of the most popular ducks for accent rugs or home furnishings are the mallard duck and the wood duck. 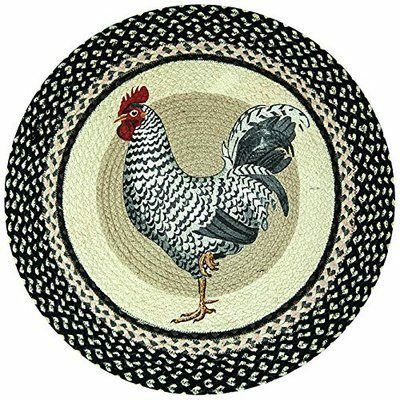 You will often see these two characters on rustic area rugs, washable kitchen rugs and even on rustic bath mats. However, you also see the popular loon in a number of wildlife rugs and duck rugs. And if you are a wild fowl hunter, you may want to consider geese. Keep in mind that your mallard or wood duck floor covering should be a bit darker than your wall color. Ducks and fish can make a fishing lodge by the lake just perfect! Use them freely in your home decorating, and you will achieve the rustic look that you want. A duck area rug can help pull the wildlife or duck decor in your room together. If you live near a lake, a river or the ocean, ducks are probably common. And most of us really enjoy watching them, or hunting for them. If you have an intricate design on your rug, you should have a plain color on the wall. Otherwise, your walls and rug patterns will compete with each other. Your rug or your walls should be your room’s focal point. Finish off your duck decor with some decorative pillows, wall hangings or pictures to complete the room’s theme. 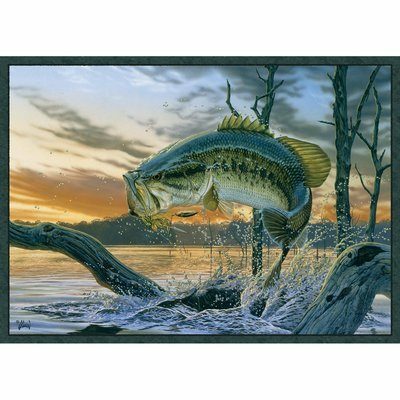 Need a fish rug for your rustic cabin or lodge? 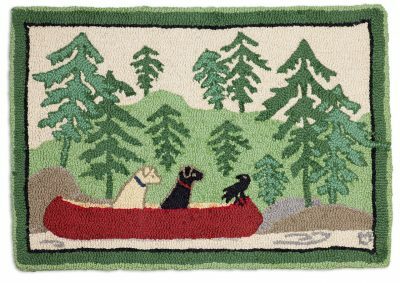 These reviews give you the low down on rustic cabin rugs with a fishing or wildlife fish décor theme. Whether you have a cabin by the lake or a fishing lodge along a river, a fish theme or wildlife theme can add interest to your weekend retreat or year-round home. If you are looking for a fish bath rug or a fish area rug for the kitchen, you’ll want to consider whether your new rug can be washed. Did you ever notice that, living by the water dominates your thoughts and your activities when you are at your lake cabin? Fishing, canoeing, kayaking, boating and swimming are just a few of the activities that you probably enjoy at the lake. So how can you reflect the thing that you love, in your rustic décor? Choosing a rustic theme, like “fish” or “fishing” can be a start. Build your room around a large, dominant accent piece, like a fish area rug. Use variations like different kinds of fish, fishing lures, fishing poles, rowboats and canoes, and even peaceful scenes of the water. Pine cone rugs draw attention to a special table, define a sitting area, look good under a small table or chair and they give warmth in front of your fireplace hearth. Pine trees and pine cones are used on most wildlife theme items like rustic area rugs, bedding, curtains and even shower curtains. Mix and match them with other wildlife motifs to add interest to your rustic pine cone theme. The pines in your décor will foster memories of quiet snowy nights in the woods or of gentle early mornings beside the lake. And decorating with pinecones is really easy, as everything just seems to fall into place. So make sure you include some pinecone rugs and pine tree decorations in your rustic lodge décor! When you think of rustic décor with wildlife or a North Woods theme, decorating with pinecones automatically comes to mind. And rightly so! Pine cones bring to mind cool autumn evenings in northern Maine, northern New Hampshire, northern Michigan, northern Vermont—or the great Canadian north! And using pine cones in your decorating will enhance your wildlife themes, whether you choose moose, elk, deer, fish or ducks. Pine trees and pine cones are used with most wildlife theme items like rustic area rugs, bedding, curtains or even shower curtains. Mix and match them with other wildlife motifs to add interest to your rustic pine cone theme. Decorating with pinecones is really easy, as everything just seems to fall into place. So make sure you include some pinecone rugs and pine tree decorations in your rustic lodge décor! A nautical rug can give a room that salty seaside feeling of living on the coast by the sea, or it can complement your beach house furnishings with a whimsical beach theme, that makes your cottage fun! Living by the sea (or dreaming of living on the coast) gives you lots of opportunities to decorate. And you can have whimsical beach kind of theme—or a lighthouse theme, or even a salty old sailor theme. You are limited only by your imagination! What do you love most about the ocean or the river? Often we can mirror what we see outside, in our decorating. A nautical area rug can have motifs of seaside creatures, weathered pilings, ships, sailors, lighthouses, or sand dunes, and it can make your home feel like it is part of the coast. Nautical theme rugs come in a variety of colors and they have a number of different motifs. A nautical rug can bring depth to your oceanside theme and they can add color to an otherwise drab room. Nautical rugs bring to mind sandy beaches, lighthouses, yachts at the harbor, the sweet smell of marshes, salty looking old sailors, yummy seafood dinners and weathered pilings and buildings by the shore. 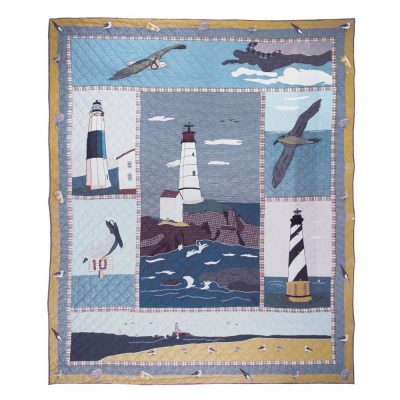 Your nautical area rugs can reflect those things in your beach cottage. Choose motifs that reflect what you love most, in your beach house decorating. Make your cottage reflect you and your family. One way to decorate is to choose a special rug to serve as the focal point of your room. Then, you can choose nautical accessories that complement your rug and its theme. Nautical rugs play a central role in establishing the mood of your beach cabin or your coastal post and beam house. And I’m sure that you can think of more! Choose motifs that you like and that remind you of the good times that you’ve had—or pleasant things that you’ve seen. Then look for a nautical rug that has those motifs or your favorite colors in it. Choose wall décor, window furnishings, table décor and lamps and other decorative pieces to carry out your theme. A lighthouse rug can brighten your beach house décor., Even if you don’t have a house at the beach, it can take you there, mentally. Imagine you are at the ocean. You hear the waves against the beach. The sounds of a ship’s horn in the distance. And you see a lighthouse off to the side, warning ships of the rocky coastline. Lighthouses send out beacons of light, and they guide us to safety, whether in a storm or just in darkness. Using motifs and patterns in a light house rug that reminds you of vacations and fun-filled trips to the ocean, can get you to dreaming–and planning your next trip to the beach! Light houses traditionally were used to mark dangerous coastlines, shoals, sand bars, rocks, coral reefs and dangerously shallow water. They were used to guide mariners into safe harbors. Even airplanes have used light houses to navigate safely into airports near the coast. Lighthouses symbolize a guide or beacon to those struggling or trying to find their way. Beach decor rugs need to be easy-care, in addition to supporting the nautical theme of your beach house. Make sure your nautical rugs can stand up to sandy feet and salt water, so they will continue to look nice after months of use. Beach house cabin rugs should be casual, to reflect your lifestyle at the shore. They will take a beating, but that’s all part of living near the beach. 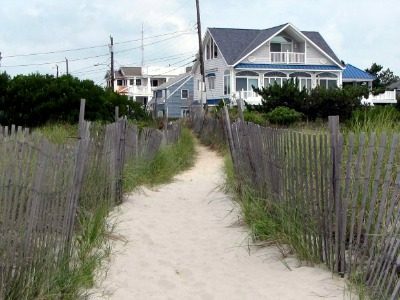 Why do you love living in or going to your beach house? Is it the beach, the splashing of the waves on the shore? How about gathering sea shells or strolling ankle deep in the water early in the morning? Beach decor rugs should reflect the things you love about your beach house. Do you like to go fishing? Or maybe it’s fun just to watch someone else fish. And I’ll bet there is at least one food that you love to eat when you’re there! Choose cottage décor items, like beach decor rugs, that reflect your tastes and what you like to do. Let your home express your interests and reinforce your love for the seashore.